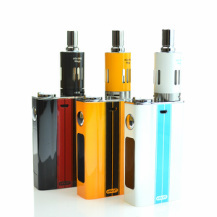 The Kanger EVOD Starter Kit is one of the most popular electronic cigarettes today. 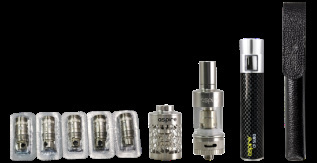 Combining high-end construction, ease of use and a great price, it’s the perfect device for all types of vapers – whether you’re still in the transition, or have been vaping for years. Presenting the eVic-VT 60W, its new cutting edge technology of temperature control, embodying the concept of a healthy alternative lifestyle. The eVic-VT features a large OLED screen, supporting VT-Ti (Titanium), VT-Ni (Nickel), and VW mode with a battery capacity of 5000mAh. Variable settings are accessed via the dial located at the top of the device to reach whichever wattage or temperature you please. In VW mode output wattage can be adjusted from 1W to 60W by turning the control knob, right to increase, and left to decrease. Holding the control knob to the right or left will make the wattage setting rapidly increase or decrease.